Obituary for Charles Fehlinger | Spitler Funeral Home, Inc.
Charles Fehlinger, 98, of Montoursville, died Aug. 24, 2018 at AristaCare at Loyalsock. 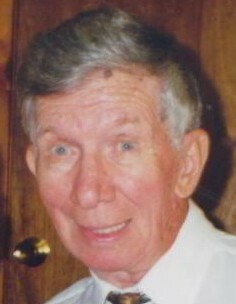 He was born Nov. 8, 1919, in Ashley, the son of the late Charles and Nell (Ardeline) Fehlinger. Charles was a WWII veteran having served in the Army Air Corp as a 1st Lieutenant on the Aleutian Islands. He retired from Conrail and was a member of the Faith United Methodist Church. He was a graduate of Bucknell Jr. College and Wilkes College. He enjoyed bowling, including a 300 game at the age of 75, fishing, ice fishing, hunting, and poetry. Preceding him in death was his wife the former, Olga S. Shypulski, who died June 9, 2011; a daughter, Elaine Ritter, a sister, Arlene Fehlinger, and a son-in-law, John D. Konkle. Surviving are his daughter, Linda Richards, of Montoursville; four grandchildren, Eli A. (Megan) Richards, David L. Richards, Douglas B. Konkle, and J. D. Konkle; three great grandchildren, Molly, Piper, Dylana; a faithful nephew, Martin Marsola, and many other nieces and nephews. A funeral service will be held 11:30 a.m., Tuesday Aug. 28 at Spitler Funeral Home, 733 Broad St., Montoursville with Rev. Jacob A. Waybright officiating. Burial will follow in Montoursville Cemetery. Family and friends will be received at the funeral home from 10:30-11:30 a.m. The family would like to thank the amazing staff at AristaCare for their compassionate care.